All RUBIROSA partners around the world can advise you on questions of care and repair. To avoid damage to the material, it must be treated appropriately. First, shoes, whether made of suede leather or smooth leather, should be impregnated before first use. 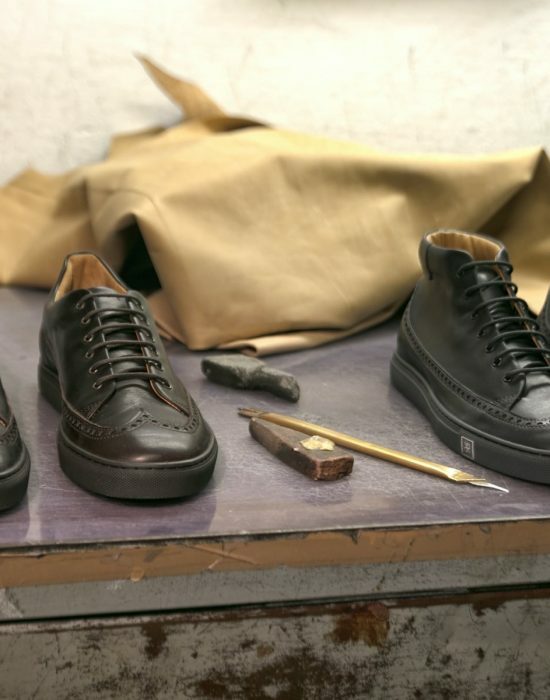 The process of impregnation protects the leather from the infiltration of moisture and dirt, thus contributing to prolonged usability of the shoe. Impregnating sprays, pumping atomizers or liquid impregnating agents can be used for this purposes. When using impregnation sprays or pumping atomizers, care should be taken that they are only used outdoors or with good ventilation. Smooth leather shoes should be cleaned with a soft cloth; if stained with coarse dirt, it should be cleaned with a brush. Special shoe shampoos or saddle soap can be used as an adjunct for this. They are massaged into the leather with a sponge or cloth and then wiped off. Let the leather dry slowly and gently. Saddle soap should only be used occasionally as it greases heavily. If used excessively, it can close the pores of the leather and colour creams will no longer be able to penetrate properly. Even smooth leather shoes should be impregnated from time to time: the right time for this is after cleansing and before the application of creams. Suede is dry-cleaned with a fine brush for dust and dirt. Then we recommend brushing through the leather with care. For suede leather, you can use brass brushes for rough cleaning. Otherwise, we generally recommend crepe brushes for suede leather. For stubborn stains or salt crusting, you can thoroughly clean suede with water and curd soap. The leather must then be completely wet so that no new crusts arise. Then stuff the shoes with newsprint paper and dry slowly and gently. It is best to hang them at room temperature so that they can breathe. Finally, they are re-roughened with the appropriate brush. To refresh the color of suede, use of a liquid paint application or special color activators from specialist retailers is recommended. There are also combination products that directly impregnate the shoe. The best way to clean horse leather is with a soft cloth. It may also be slightly moistened to better remove the dust from the surface. Under no circumstances should soaps or other cleaners be used as they would dissolve the valuable grease from the leather. Do not buy your shoes too big and not too small. The right size often saves you many problems and increases the lifespan of your constant companions. Use a shoe horn, because nothing beats a quick and easy entry. The real advantage, however, lies in the longevity of the heel part, because the shoe counter is less burdened by the shoehorn on wear, and the shoe will not be damaged as quickly. The best way to avoid deep creases is not to let them emerge. To extend the life of your shoes, use a shoe tree (preferably made of wood). In principle, all shoes should be provided with shoe trees to prevent the leather becoming brittle, to maintain the shape of the shoe, and to simplify cleaning. When doing so, make sure that the forepart fits snugly into the front part of the shoe and that the shoe tree is not set too tight. Excessive tension can quickly lead to undesirable shaft deformation of the shoe. Airing and wearing shoes alternately is very important for durability. During the day, the shoe absorbs a lot of moisture, which must leave again after a corresponding rest period. Give your shoes the break they need and the shoe climate will improve noticeably. The storage of footwear is equally important for proper shoe ventilation. Protect your shoes from dust, light, and, above all, moisture. Furthermore, the shoes should be placed in a well-ventilated space and have enough space that the neighboring shoe does not scratch its surface. The aforementioned passive care instructions can help the shoe last long. In addition, direct shoe care is of particular importance. Depending on the material (smooth leather, suede, horse leather) different care products should be used (see above). If your shoes require repair despite the care instructions, going to the shoe specialist is the only way to get help. Whether the shoe has loosened seams, split splices or worn soles, use the expert advice of your nearest specialist or inquire at a RUBIROSA dealer in your area.